Normally in the Camera view, any visible line or drawing can be selected. When you enable the Works on Single Drawing mode, only drawings from the currently selected layer can be selected. The Apply to Synced Drawing Layers option works in conjunction with the Works on Single Drawing mode. 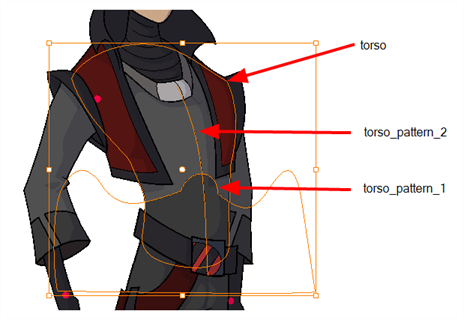 The Works on Single Drawing mode still limits the selection to a single layer, but the Apply to Synced Drawing Layers option allows for the inclusion of drawings on layers synced to the selected drawing layer. 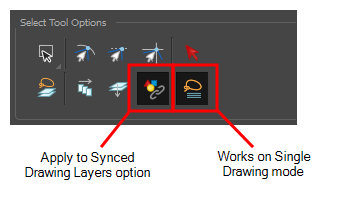 In the Tool Properties panel, enable the Works on Single Drawing mode and the Apply to Synced Drawing Layers option. In the Camera view, select a drawing or any of its corresponding synced drawings. Notice that only those drawings are selectable.